A circus truck carrying the elephants crashed on a Spanish highway. The accident prompted an elaborate rescue after the jumbos tipped onto the road. 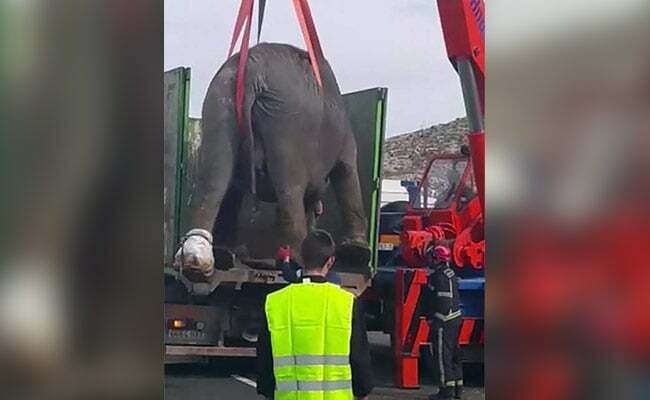 Madrid, Spain: An elephant died and two others were injured on Monday when a circus truck carrying the jumbos crashed on a Spanish highway. The accident prompted an elaborate rescue after the animals tipped onto the road. Photos and videos posted on social media show the elephants roaming freely on the highway and even grazing on grass growing on the side of it. The injured elephants were lifted off the highway using cranes. The circus truck was overtaking a slow vehicle on the highway near Pozo Canada in the central region of Castilla-La Mancha when it suddenly overturned, said a spokeswoman for the DGT, the government department that oversees Spain's road network. The highway closed to traffic for around two hours as authorities sent cranes to lift the injured elephants onto other vehicles and move them from the road. One video showed an elephant being lifted as firefighters stabilised it by holding its big feet, one of which appeared to be wrapped in a bandage. There were five elephants in the truck and another video showed the two uninjured elephants being led away from the scene. Photos of the accident showed the truck lying on its side across the highway, with some of the elephants standing nearby. Later, the Pozo Canada council posted a short video of the four surviving elephants in a compound. In a tweet, the council said that the pachyderms were being looked after by the local authority until they could be transferred. Spain's animal rights political party PACMA tweeted that the four-legged creatures belonged to the Gottani Circus and called for the end of animal uses in circuses. "The lorry that has overturned was carrying Circo Gottani elephants. Show them more kindness. We treat animals like slaves. Enough of circuses that use animals," Silvia Barquero, the president PACMA, tweeted.